It is one of the largest malls in the city, but apparently, needs a lot of things to add to. Despite that, you can always come here expecting to spend a good time here. There are myriad shops dotting the premises with a vast product range, covering literally everything from footwear, perfumes to apparels, accessories and what not! There is a cosy food court with numerous food options that will spoil yours for choice. If you are visiting with kids, it is even better! As the children will also get plenty of things to enjoy here. Ensure to take a souvenir with you while you are at it! Smoking is prohibited within the premises except smoking zone. 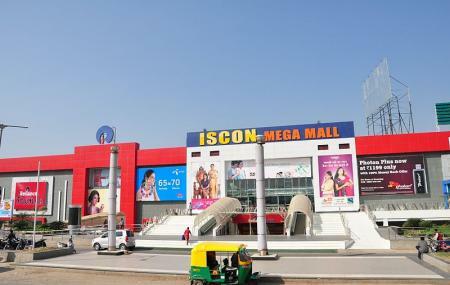 How popular is Iscon Mega Mall? People normally club together Sardar Vallabhbhai Patel Stadium and Karai Dam while planning their visit to Iscon Mega Mall. It's a shopping mall. You will get food, clothes, vegetables, kitchen wear, dairy products, chairs and so on. It's a very big and specious mall.kids will have nice time to. Parking is easy. You will have other shopping items also. You can get your time passed for 3 to 4 hrs easily. get many branded shop here. but reliance mart are trending. Now, reliance fresh is only saviour od this mall. Most of the showroom are closed as faster than expected. Reliance stores offer good choices in food. Overall good mall. Was a huge bustling mall few years ago. Not maintained that well now in 2019. A lot of the sections of the mall is closed off, perhaps due to vacant shops. Reliance chain shops (trends, electronics etc) gather most of the footfall. No multiplex or decent food joints. Just think of it as a large convenience store and you won't be disappointed. Nice mall. But washrooms are not maintained properly. Good place for Reliance lovers.